A bouquet of red roses showed up with my husband on Friday. What a sweetheart. We have enjoyed this weekend MUCH more than the previous, lost weekend. In the midst of sickness, I wondered if I would ever have energy again. Our God-given healing mechanism is amazing - I spent Saturday outdoors, digging in my garden. The dirt was a little heavy with moisture, but the sun shone and I rid my garden bed of the last of the pesky vinca and lamb's ears. No more spreading plants for me. Not content to confine themselves to an allotted amount of space, they threaten to take over the entire garden bed and suffocate anything else that tries to grow there. Today we're back to chilly winds, clouds, and occasional drizzle. A good day to stay indoors and play with my camera and roses. How did you spend your weekend? Linking with Mosaic Monday, hosted by Mary of the Little Red House. How very beautiful those velvety roses are, there is nothing quite like a perfect rose. What a sweet guy my cousin is! Your roses are gorgeous. Thankfully your lost weekend is history and you are energized enough to do some gardening. The roses are beautiful and I'm glad you're feeling well enough to enjoy them and work in the garden. Mine is still under the snow, so it's been a bit of knitting, cooking and reading for me this weekend. There are good smells coming from the kitchen right now. Have a lovely (and healthy) week, Lorrie. I love dark red roses! They are beautiful! And I'm glad you are feeling better...take care of yourself! I went to a BIG festival yesterday and an Art Show today...my best weekend! Hugs! Beautiful roses. They are a delight. Beautiful roses, you have a sweet hubby! Have a happy week! Such a beautiful bouquet! I'm glad you are feeling better. I spent the weekend mostly doing chores! But I also got some reading done and a little bit of Photoshop work. You like Pamela have lots of color tonight. Love your roses and the way you have photographed them. And thankful you are feeling better. What a lovely bouquet of red roses! Glad you are on the mend. Isn't that just how illness is? When you are at the lowest, you cannot imagine ever feeling good again! What a mercy that we recover relatively quickly. Your roses from your sweetheart are beautiful! So glad to hear that you are able to work in the garden. 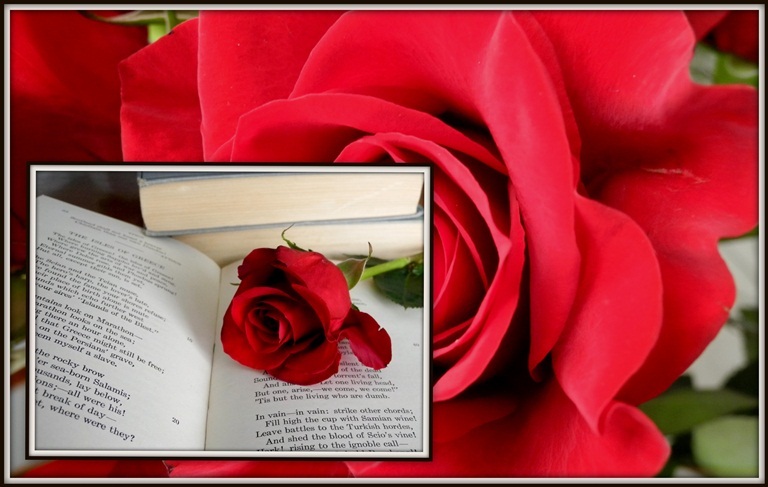 Your luscious red roses are gorgeous! I'm sorry you weren't feeling well, Lorroes, and I'm happy to hear you are a bit better! Your red roses are beautiful! It was a snow day today for me. We had over a foot and the plow did not clear our street so I stayed in and relaxed all day. It felt good! lovely roses...glad you are bit better.. So glad you are feeling up to speed once again. Beautiful...the red roses! What stunning roses, and so beautifully photographed - what a lovely husband you have. What a sweet man to bring you red roses. They are beautiful! We had a beautiful winter weekend with no storms. I see you have a spam comment above and I got the same one. I'd like to know how to stop these guys but I see they have eeked their way into Blogger. Gorgeous roses and lovely photos of them! Simply exquisite deep red roses. I can see how they came home with your husband just for you. I didn't realize that vinca could take off in a garden garden like that. I use it sometimes as a trailing planting for containers and window boxes. The lily of the valley was all that I ever want to dig up again. In fact, it beat me. I gave up before I got it all out and I'm not going back to digging so it'll be some nasty plant killer unfortunately. We had a quiet Saturday and a lovely Sunday with family. It was good.